Are the 'climate will affect sports stadiums' claims of U.S. 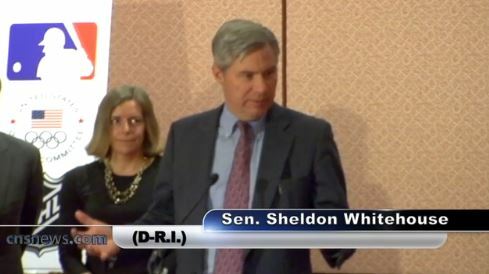 Senator Sheldon Whitehouse the dumbest ever? | Watts Up With That? Are the 'climate will affect sports stadiums' claims of U.S. Senator Sheldon Whitehouse the dumbest ever? An examination of the data suggests “quite possibly”. You can read the press release from the Senator’s office here. Senator Sheldon Whitehouse (D-RI) warns sports stadiums are at risk from the “sea level rise effects of climate change,” and that climate change specifically threatens hockey and skiing. “We see significant sports facilities, the palaces of – of sport that are at risk from the storm, climate, sea-level rise effects of climate change,” Sen. Whitehouse said today following a closed-door climate discussion with executives from the NFL, NHL and NBA. 17,000 years! Hardly a problem for the present and it may not even be a problem for the future, as I sincerely doubt the stadium will last that long. We may be in a new ice age by then. Let’s look at some others near his sphere of influence. 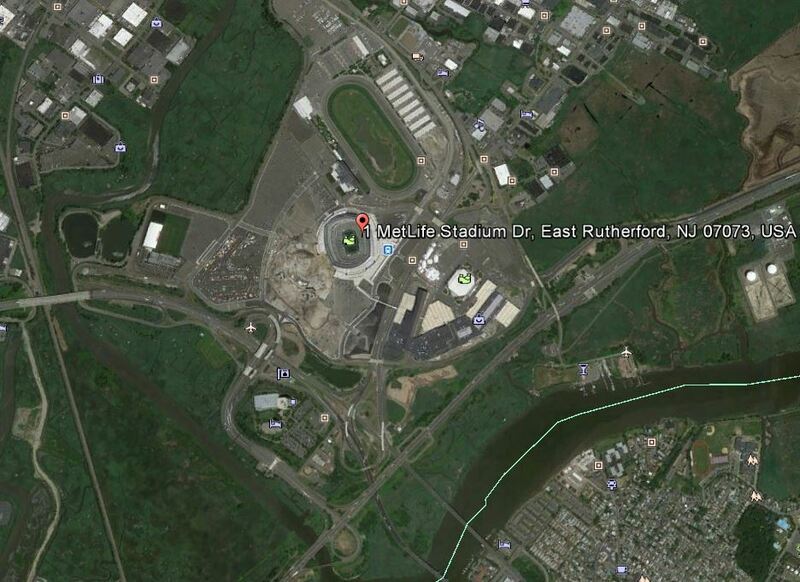 How about the New York Giants stadium in the Meadowlands? Giants Stadium was demolished in 2010 and replaced by MetLife Stadium, located adjacent to its former site. Built in 1976, it only lasted just over 3 decades. It is about 2/3 of a mile from the nearest ocean linked waterway. According to Google Earth, it is about 10 feet above MSL, a fact that apparently didn’t concern the architects, backers, and owners of the new stadium. I’m willing to bet a new stadium will be built well before then wouldn’t you? OK, How about Boston? 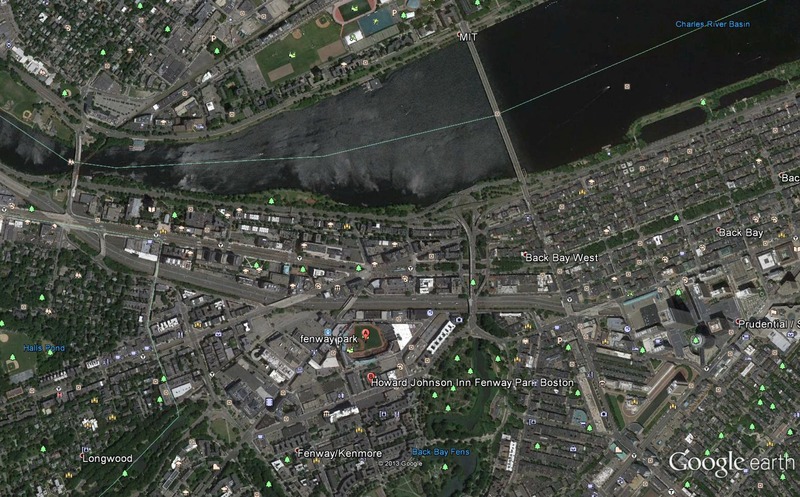 Fenway Park isn’t far from the water, approximately 1/4 mile from the Charles River Basin and just across from MIT. Like the former Giants Stadium, it is a mere 10 feet above MSL. The nearest NOAA tide gauge in Boston is located on the right side of the U.S. Coast Guard Building adjacent to Northern Avenue Bridge (now closed), about 2.3 miles from Fenway Park, which opened in 1912. Like Giants stadium, will Fenway park even be around then? Will it be around in 100 years or will it go the way of many older baseball parks, demolished and relocated/rebuilt to handle bigger crowds? 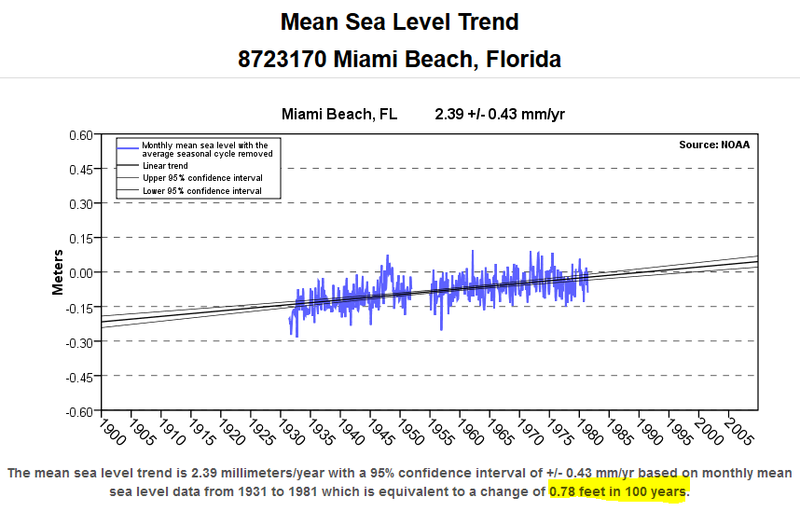 Climate alarmists often say that low lying Florida will be greatly affected by climate change induced sea level rise, and Miami will be underwater soon. So let’s try a sports stadium in Miami. Unfortunately, the station was removed in 1981 after 50 years of service. I suppose sea level rise wasn’t a big concern or they would have kept it. The rate up until then wasn’t much different that the other tide gauges we’ve examined at 0.78 feet per 100 years. 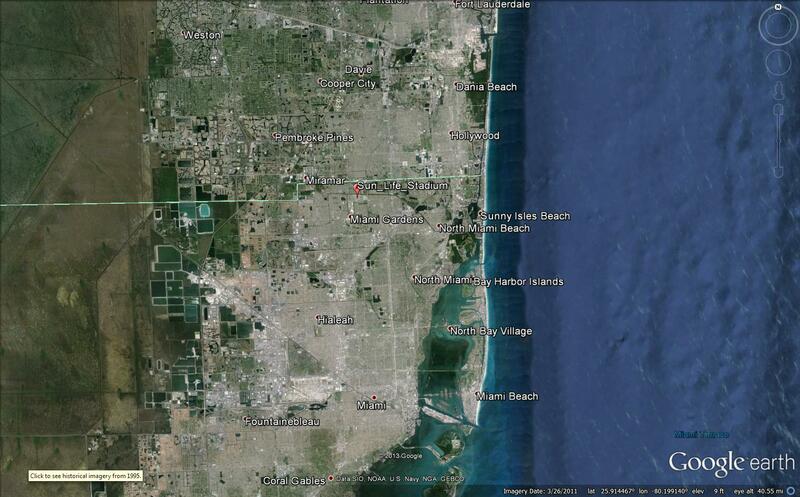 The nearest working gauge to Miami Beach is Naples, Fl, showing only 0.66 feet per 100 years. 6 feet/ 0.0078 feet/year = 769.23 years. Will we even have an Orange Bowl Game then? Who knows? While Senator Whitehouse is from the east coast, maybe we’ve concentrated on the east coast too much. Let’s try the Gulf of Mexico. 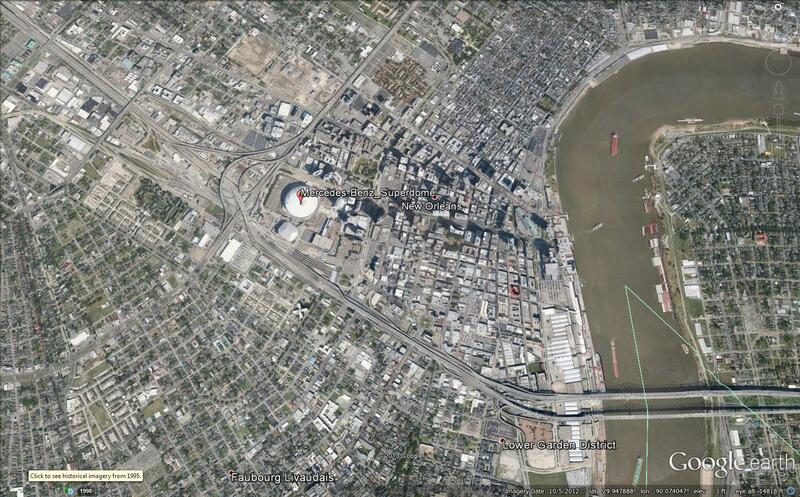 Surely the Mercedes-Benz Superdome stadium (built in 1975) in low lying New Orleans is threatened soon? The Superdome was used as a “shelter of last resort” for those in New Orleans unable to evacuate from Hurricane Katrina when it struck in late August 2005. Located about 1 mile from the Mississippi River, Google Earth pegs its elevation around 1-3 feet AMSL. The nearest NOAA tide gauge is south of New Orleans, about 50 miles at Grand Isle, and is directly on the Gulf of Mexico. 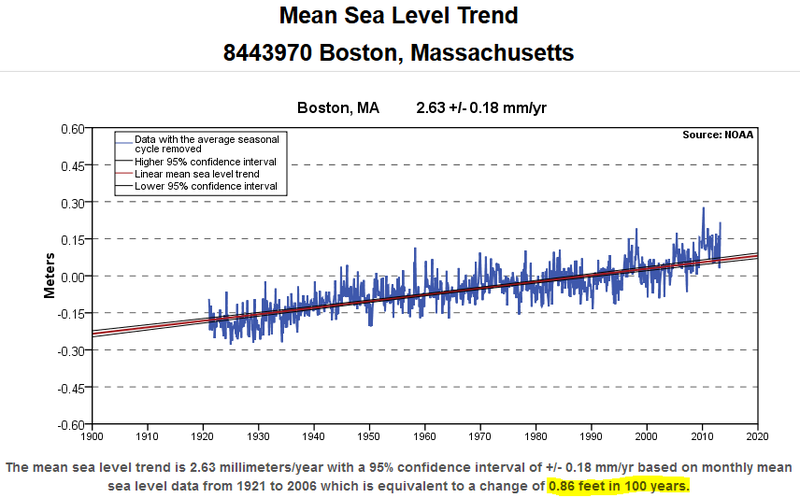 It has quite an astounding rate of sea level rise of 3.03 feet in 100 years. Some of us, though probably not Senator Whitehouse, will be around to see that. I have to wonder though why he isn’t calling for an abandonment/evacuation of the city or New Orleans, since many of the wards are below sea level now. Oh wait, that’s right, they’ve adapted to the subsidence that plagues the city, something they’ve know about for quite some time. 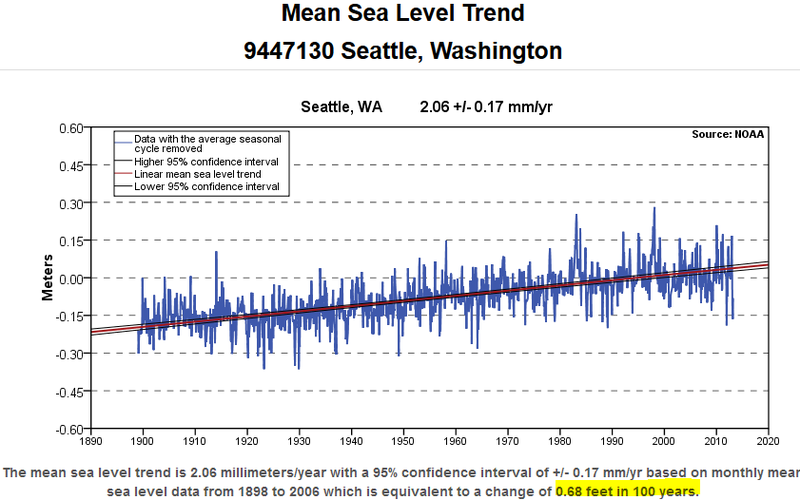 Maybe sea level is threatening west coast sports stadiums? 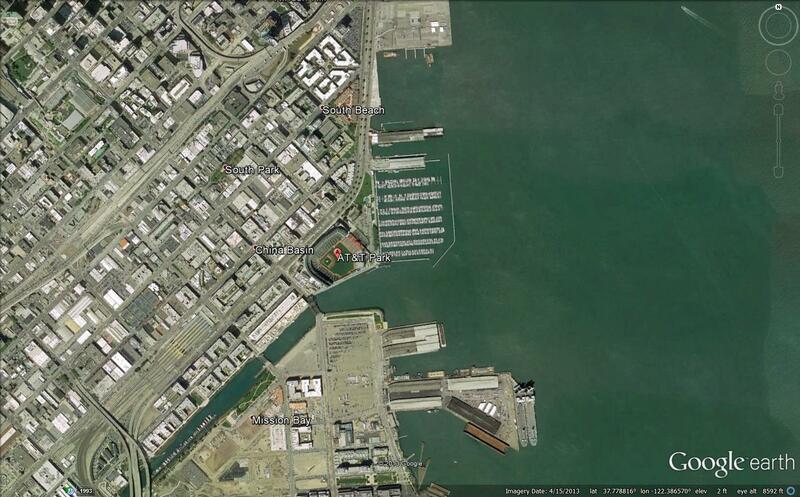 San Francisco’s new AT&T Park built in 2000, right on the bay, surely is threatened. 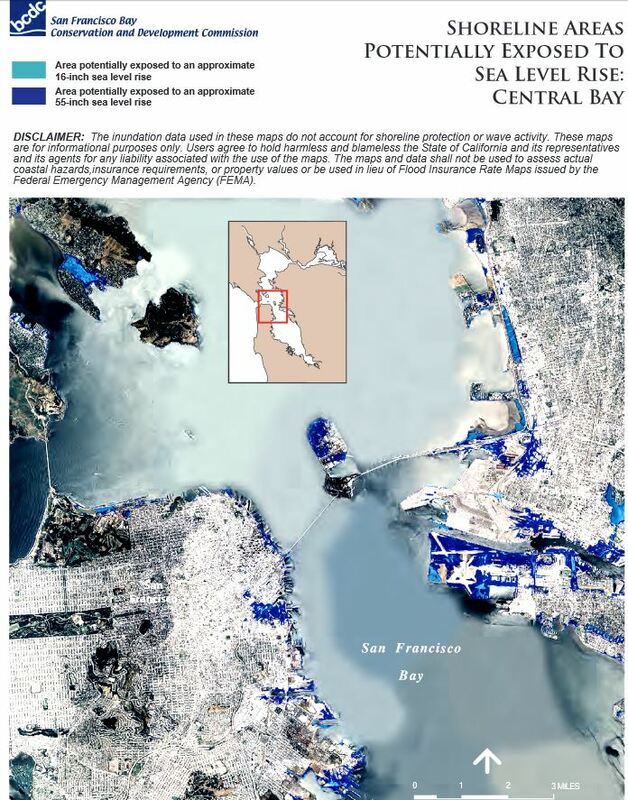 It is located in one of the blue zones of the map above, just SW of the Bay Bridge. 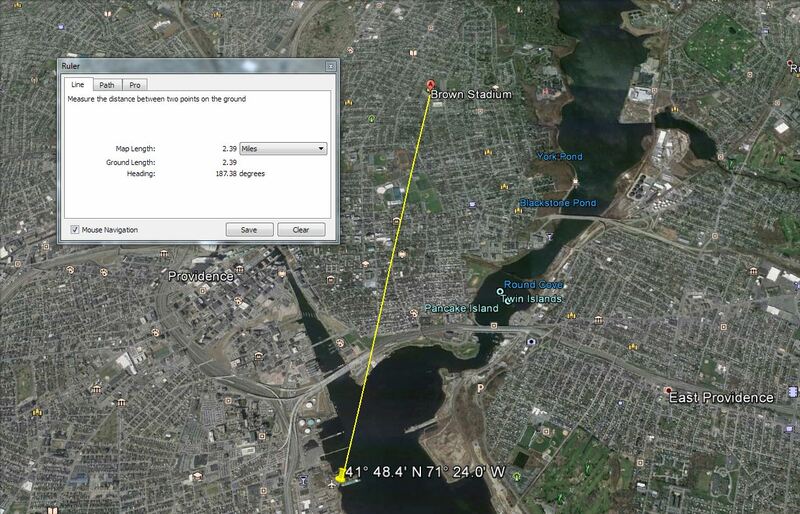 According to Google Earth. AT&T park is about 9-10 feet above MSL. It is more likely that San Francisco and the new stadium will devastated by an earthquake before then. And, chances are that A&T park won’t have much more of a lifetime than many of the others we’ve touched on in this article. Maybe Senator Whitehouse was talking about Seattle. Yeah, that’s the ticket. CenturyLink Field (home to the SeaHawks) and the nearby Safeco Field (home to the Mariners) are right off the wharf, and less than 1/2 mile from Puget Sound. Google Earth places their elevation at 17 feet above MSL a twofer double threat in the eyes of Senator Whitehouse I’m sure. The nearest NOAA tide gauge at Seattle just 1/2 mile northwest of the stadium at Colman Dock, has a calculated trend of 0.68 feet in 100 years. Drats. Surely there must be a sports stadium somewhere in the USA that is threatened in the near future by sea level rise, so that closed door meetings with sports franchises with the highly distinguished senator from Rhode Island can make his sales pitch factual? The facts suggest Senator Whitehouse doesn’t even fit the definition of useful idiot. What is dangerous and sleazy is that behind doors, we can assume much talk of trading influence for money was discussed. If it was honorable, it would have been open. the AGW movement at heart is always about using other people’s money to line the pockets of the climate kooks. That answer for Brown Stadium should be 17,187.5 years rather than 1,718.75. For those east coast locations, consider it’s all the same ocean. 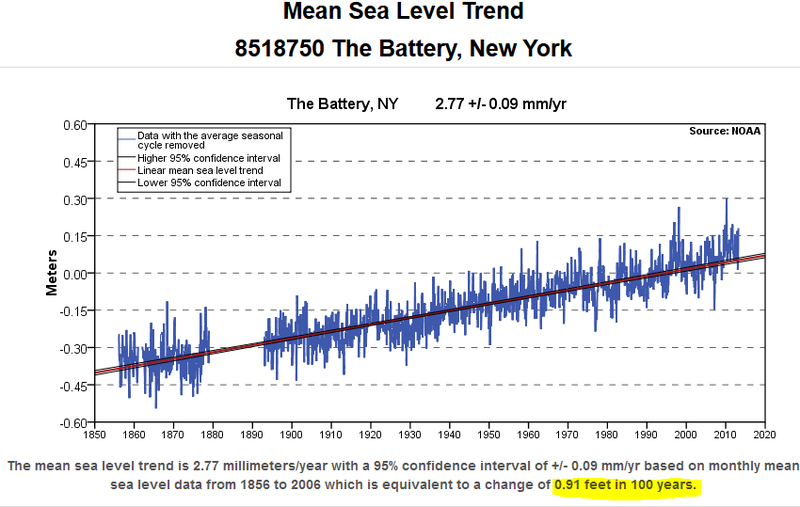 So with greatly differing values of “sea level” rise, clearly it isn’t just the sea affecting the gauges. In SF, all those lands in blue are fill. So add more fill. And if there is more to the story on the east coast, there is almost certainly more to the story regarding sea level rise on the west coast too. I’m not nit-picking, just trying to help. 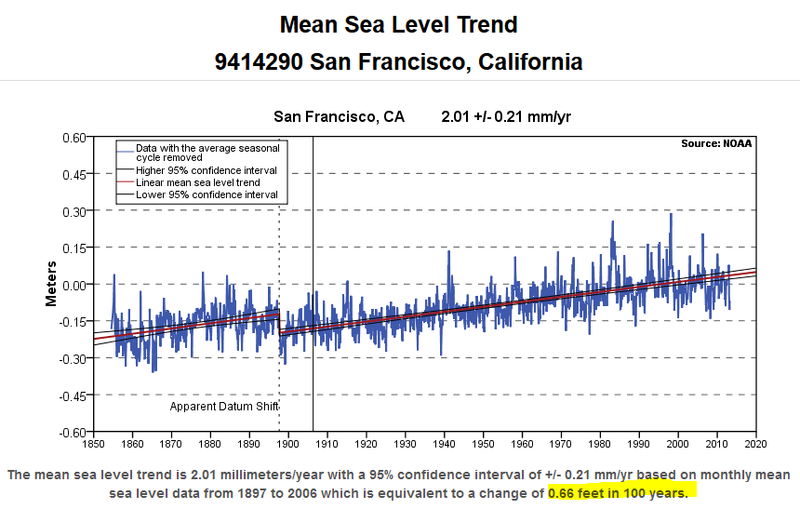 It is of interest perhaps that the Science Museum in San Francisco is all about warning of major sea level rise from global warming. To my knowledge the Warriors stadium moving to the waterfront has not been impacted by these concerns. 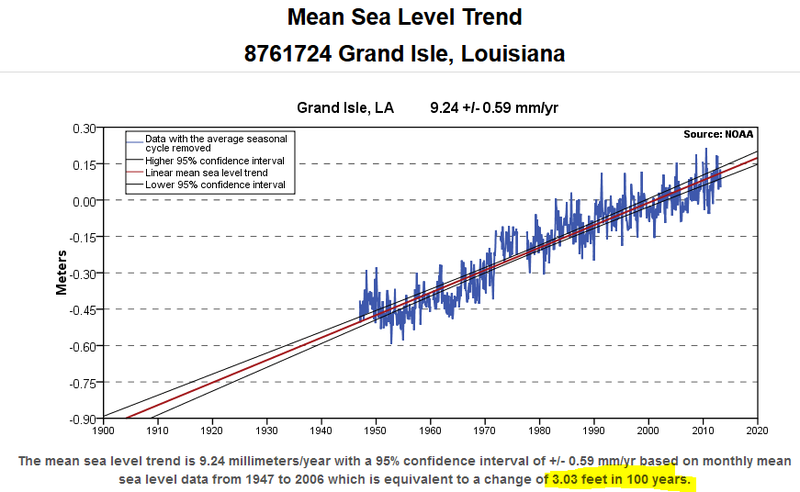 Re: New Orleans “astounding rate of sea level rise of 3.03 feet in 100 years. plus a subsidence rate of 2.28 feet per 100 years, which is perfectly normal rate for a delta of a world class river system. No amount mount of climate change legislation/taxation/regulation/dictation is going to change the subsidence rate. Indeed, if worldwide sea levels dropped, subsidence rate of New Orleans would likely increase, perhaps catastrophically from slumping. Did you let Senator Sheldon Whitehouse (D-RI) know of this quantified peril? Dumbest ever? Hmmmm. That is a high bar indeed. I can’t answer that one because there are so many worthy competitors in climate “science”. I will say that there are plenty of structures world wide that are close to the sea’s edge and have been there for decades on end. These places show no danger of being covered by the sea. 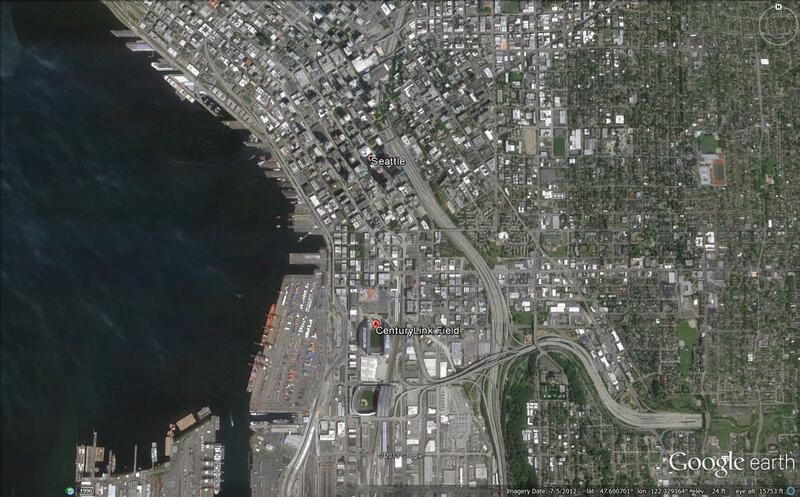 And if a sports stadium were to be lost to this mythical sea rise — so what? Should we destroy the industrial economies of the world to save a few sports stadiums? Give me a break. I am only eyeballing those two graphs but it looks like there has been a ‘pause’ in sea level rise from around 1980 or so. Anyone care to draw a trend line? This is right here is how we are and will continue to win: facts, facts and more facts. They can wave their hands and shake their overly-tanned faces (Ahhhnold), but that doesn’t change the facts. It still shocks and sickens me how people who are supposed to be so much smarter than us plebes have all this influence to spread their lies. Regardless, we are working in the shadows, making bunny ears behind them in their photoshoots, themselves complete oblivious to it all…much like they are of any shred of reality. The Amsterdam Arena is already 3m below sea level. It’s worst than we thought! Remember, the Superbowl will be played in MetLife Stadium this year. It looks to be a colder than normal winter on the east coast and a pattern is developing that might bring nor’easters up the coast this season. The NFL and some green groups are conspiring to spread climate alarm and a few well placed ads coupled with a little help from Mother Nature might make for some interesting messaging about climate change and sports stadiums. It’s dumber that we thought! Although, nothing really beats that the oceans will smell different from climate change. So, we know that the mid Atlantic ridge is rising grom the ocean floor and the whole Eastern seaboard is sinking due to tectonic movements. What has that to do with climate change? Seattle’s going to cop a packet when the Cascadia Fault next shifts anyway,that’s going to be a lot closer than 2,500 years in the future. edit note re New Orleans: ” they’ve adapted to the *subsistence* that plagues the city” perhaps intended to read ‘subsidence’? Me thinks one of his staff must have tried to explain the stadium wave theorem of climate to the esteemed gentleman. But not to fear, has anyone told SW that the stadiums will be destroyed in the tsunamis caused by the impending capsize of Guam? Given the deal Obama just handed Iran, by comparison, Senator Whitehouse appears to be a cool, calm, rational man making decisions based on the facts at hand. Maybe I’m odd, but if I were worried about sea levels, probably the very last concern would be the sports stadiums. Of course, team owners are always looking for someone to build them a new stadium. so they won’t laugh out loud at this buffoon. The lack of concern for rising sea levels in Seattle is evidenced by the current construction of a tunnel to replace the Alaskan Way Viaduct (SR 99) along the city’s waterfront. The southern tunnel entrance will be closer to the water than the stadiums. Those concerned about rising sea levels did not make an effort to replace the elevated highway with another one. Why wasn’t Sen. Whitehouse out here alerting us to the danger before we sank billions into these expensive capital projects? Dumb and Dumber – Whitehouse and Waxman. Since about 25% of the human produced CO2 in the atmosphere is a result of the US economic activity of the past century, and since the IPCC and US scientists tell us this CO2 will remain in the atmosphere for hundreds of years, when can we expect the US taxpayer to cut a check for 25% of the cost of relocating facilities to higher ground in the rest of the world? After all, the EPA in the US has declared CO2 a dangerous pollutant. The courts have upheld the EPA’s right to make such a ruling. Thus the precedent has been set. Shouldn’t the US, as the largest source of CO2 pollution for the past 100 year, now pay the rest of the world to clean up the 25% of the mess they created? Isn’t the polluter responsible to pay the cost of cleanup? BO was required to pay billions of dollars for the hydro-Cabon pollution they caused in the gulf. Shouldn’t the US pay many hundreds of trillions of dollars to cleanup the Carbon pollution they caused in the rest of the world? Is there any doubt that Senator Sheldon Whitehouse through his comments is helping make this happen? How, it if the US establishes that CO2 is responsible for these damages, and the US has historically been the largest source, how can the US expect that some day there will not be an accounting? A lawsuit to end all lawsuits? So while these welfare-queens-in-luxery-boxes (owners) were sucking up to this two-bit pol, did any of them actually promise to keep their taxpayer subsidized digs in place for more than 25 years? What’s the big deal? They’ll just have to make sure the next taxpayer fleecing is used to build a new stadium/arena on higher ground. I read this story in my daily Global Warming/Climate Change Google News feed on Friday. Wow. Just Wow. About his serious lack of reality. Just sent the link to this article. It should be sent to every newspaper on the east coast if not the entire country. Let’s see how the residents vote in the next election…. The easy-to-melt ice has already melted. Low elevation and low latitude ice is gone. That explains why the sea level rise slows following a rapid increase after a glacial period. The ice builds from falling snow – a slow process. Melting is much faster as precipitation falls as rain when temperature increases. The only real question is what does Sen. Whitehouse have to gain from this? Follow the money. How soon will Sports Authority Field at Mile High (gag!) be covered in snow? Then firn? Then ice? Then begin to slide? Only Sen. Whitehouse knows. This ranks below another Congress person who feared some island may tip over if too many people populate on one side of an island. Sen. Whitehouse is working on bipartisan legislation with Rep. Hank Johnson (D-Ga.) who believes that islands float in the ocean. The two lawmakers are working hard to head off the serious risk that sea-level rise will cause islands to float over land and collide into sports stadiums. Shorter Whitehouse: Youse guys have been…ahem…team players on other statist agenda items. Continue publicly supporting our causes and we’ll make sure the Fed poofs a few extra zeroes up, just for you. These stadia will make great marinas when they are finally overwhelmed by the rising sea levels. How many more first-of-Aprils are we going to get this year? With respect, calculating the years for MSL to reach a structure’s height above MSL is not the issue. Flooding occurs long before that time. Flooding occurs at high tide with large waves, and with storm surges. The East coast clearly has high tides and large waves, and the occasional storm surge. The West coast almost never has a storm surge from a hurricane, but does have high tides with large waves. At Malibu, California near me, the highest tides reach 7 feet above MSL, and large waves of 13 feet are common. Beachfront homes at Playa Vista on Dockweiler Beach, California, are protected each Fall and Winter by an artificial sand dune approximately 20 feet high. The dune blocks the ocean view, but this apparently is an acceptable tradeoff. I wouldn’t be too hard on the good senator. I’m sure he’s just saying what his handlers have told him to say. This reminds me of the Roman Empire and their conquest of tribes. As they subdued the populace they subsumed the local religious beliefs into their own practices. Here we have the Climate Priests subsuming the Sport Gods into their panoply of belief, dogma and practice! When do we get to sacrifice the virgins? Crosley Field was replaced by Riverfront Stadium which has since been replaced by another. Buck Rogers was a popular serial in the theaters back in ’37. Now SciFi is presented as SciFact. In addition to the dread sea level rise, the Seattle area has to worry about earthquakes, tsunamis, and lahars from Mt Rainier. I don’t know if one can get to the stadium, but they have reached Puget Sound and may cause a tsunami that does. The Tacoma area has been reached. I think living in San Francisco is safer. It’s not the Senator that’s worrisome. It’s his job to scare the populace so he can “do sumphin’ ’bout it.” It’s the no-information voters that buy in to this carp that scare the bejeezus out of me. Did we need an IPCC style organisation to ‘tackle’ sea level rise between 1800 to 1987? Did we make it? Yep. Why are these bastards wasting our time and spending our taxes? Holland anyone? Polders? Concrete? Thames flood barrier? Accretion? Coral Island atolls rise? It’s time to call the police on this fraud. I’m pretty sure we’re safe here in Denver – at least for the moment. Ignorance can be cured, but dumb? That’s forever. Without the gullible, politics would not exist. Hominids had woodfires, maybe even coal fires, but the invention of the toxic methanogenic anthropogenic mixture known as “beans and salsa” had to await the evolution of agriculture during THIS interglacial, the Holocene. Only Homo antecessor, the ignorant or intellectually challenged could realistically be expected to believe such guff, Senator Whitehouse. And that’s literally (meaning from the literature) all there actually is to it. And this is where you get to impress us Sheldon. Or any WUWT number-crunchers (I am thinking Willis might be interested) up to the task. Please provide the total annual carbon footprint from all sports complexes/events etc. You know, US-football/baseball/races/etc., rest-of-world-football, fuel equivalents for all fans/players/etc., lights, whatever, wherever (include Olympics fractions). Then split-out the ones that would be drowned according to your claim, and compare that to those that would have been drowned out by just +6M and +63M amsl had we been as carbonized at the end-Eemian. At the end of the Holocene, the question is: what is a significant number? Typo: +63M was supposed to be +52M (lousy keyboard). I remember the times when they told us that the Scottish ski industry was doomed. Same too for the alps and the US ski industry. The really funny thing is that no right minded person talks about this anymore except the good Senator. Why? Peak out the window, it’s snowing / icy pellets in southern California and Dallas as I type! As for Scotland some of its ski resorts were closed due to too much snow last year! Sheeesh! Unusual cold and a potent storm is combining to bring more snow, icy weather and travel hazards from New Mexico to Texas and Oklahoma this Sunday. Scottish snow is just a thing of the past. Little Scots kids just don’t know what snow is. Sorry, the Scottish ski resort of CairnGorm was closed in January 2010 due to too much snow! LOL. What about this year? It’s doom and gloom I’m afraid. It’s all over, tell the kids what snow was like. Scotland’s ski season is set to begin at the weekend – just 170 days after the previous one ended – sparking fresh hope of a bumper winter on the slopes. CairnGorm Mountain, the busiest of Scotland’s five snowsports resorts, has had decent snowfall over the last week and expects to open on Saturday on what will be the earliest start to a season for five years. Oh Canada. Ye are doomed. Your children will not noweth what snow is. One half of North America’s largest ski area will open this weekend, thirteen days ahead of schedule. Whistler Mountain at Whistler Blackcomb, Canada, will now open on Saturday, thanks to cold temperatures, intensive snowmaking and heavy snowfall. Five lifts will be in operation and guests will have the option of uploading from the Whistler Village or Creekside gondolas, with three lifts running higher up the mountain. Blackcomb Mountain will open as scheduled on 28 November. But what about our rising seas? Sea levels have been rising since the last de-glaciation. No honest acceleration detected. I recall the blockbuster showing sea level fall around the USA! I must be mistaken. Let me check. In the meantime here is some enjoyment. God, I thought we had some stupid, inept politicians in the UK but even we can’t compete with this level of stupidity. Ahhh here it is from 2011. It’s worse than I could ever have imagined. I’m sure that the promised acceleration is in the pipeline of deceleration. We must act now!!!! November 24, 2013 at 1:52 pm	“This reminds me of the Roman Empire and their conquest of tribes. As they subdued the populace they subsumed the local religious beliefs into their own practices. Here we have the Climate Priests subsuming the Sport Gods into their panoply of belief, dogma and practice! When do we get to sacrifice the virgins? I do sometimes believe we are already in competition with the most corrupt and ridiculous Roman Emporers as power becomes more centralized (EU) and World Empire (“United Nations”) activists become more privileged and debauched. It was the Emporer Caligula who declared war on Poseidon, god of the sea – not unlike President Obama’s declaration of war on a trace gas in the atmosphere, and campaign pledges to heal the earth and lower the rising seas. Caligula’s attack on Poseidon – Horrible Histories (my daughter loves this show); ends at 3:08. Well if these dire predictions are true, some existing beach volleyball nets are going to be in trouble. His children might never know what snow is or why people skied down mountains. The subsiding of the delta at my home town of New Orleans, and points south, has been known for maybe 50 or 60 years. And it was primarily ANTHROPOGENIC causes!!! Gasp!! Not climate change but physical structures and such we humans built in the name of flood control. For eons the river deposited silt and the delta grew, Then we decided to build levees and divert the river thru another basin west and so forth. The Superdome is doing fine, and will do fine for a long time. I would be more worried about New York. Just visit the “SLOSH” models for storm surge. The superstorm up there was nothing like it could have been. I would be more worried about the ski resorts that have too much snow and the floods that we saw in Colorado this summer when I was there. I see a very concerned Arnold Schwarzenegger. 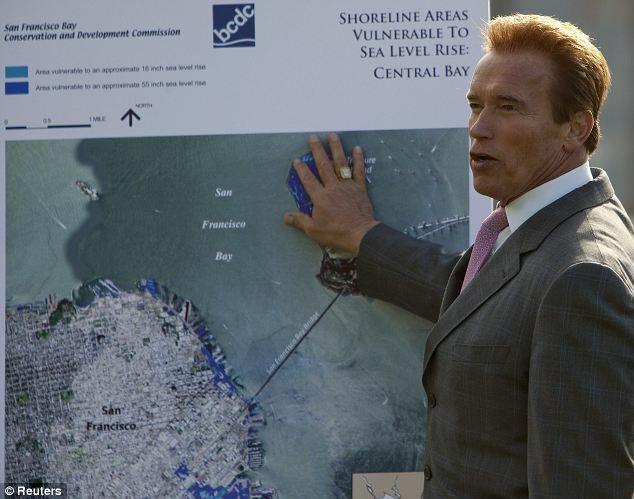 Why is Schwarzenegger concerned? Is it because of his many, many, many CARS?!!!!! Surely not. We the people should be scared. But not about global warming and sports stadiums under water. We need to be scared (and outraged) at the stupidity of certain political leaders. It’s truly frightening. A useful idiot should at least speak SOME truth. Sadly, the Senator does not make the cut. On a related topic, I remember there was a You Tube video showing an endless stream of Democrats railing in their finest Viner manner about “kids won’t know what winter/snow/cold is anymore”. Unfortunately, my bookmark now goes to a “video pulled because of copyright” message. Since most of the videos were from the US Congress, that seems kind of curious. Anyone know if something similar has been posted again? Well, at least this genius is still on full display. The man is a steaming f***, he is so stupid he could lead the Tasmanian Greens. Oh and I’m not sure if it’s the same in the US , most buildings in the UK have a theoretical design life of sixty years. Know you have been conned you will not retaliate. Perfect. Representing the people, emphasizing the most crucial priorities and handling those crises most urgent in the minds of his constituents. A man who is really ‘in touch’ w/ the average citizen! Ten more of him and Congress can go skiing all year long! Here is the good senator’s website on the good global warming religion. It’s worse than we thought! It’s much, much worse than I previously thought! Of your time. It is worse than we thought. ……….. well, the Raiders could surely play better if they had their pirate ship back. Zoom out for a regional view of the White River and its change in direction here. It is coming from the northeast side of Mt. Rainier. There is a ridge to the north and east between this change in direction and the smaller Green River with its origin well north of the volcano. The drainages are well separated until they both get to Auburn. The wiki entry for the Green River explains the history from Auburn on to the Sound for both rivers. The wiki entry for the White River explains its source as the Emmons Glacier (& the West Fork at Winthrop Glacier). 2. There are numerous faults in the Puget Sound region but the big event will be when the subduction zone releases. The resulting tsunami will be mostly a coastal event to the more sparsely populated west. The “Orphan Tsunami of 1700” (of Japan) is a USGS publication on the web. More on the current research is found on the PANGA at CWU site. Wow, what a response to such drivel from a Senator (given that that’s what most of what emanates from such is so). Glad to see most of us consider such persons ignorant, if not practical morons, but, sadly not irrelevant. Burn: an Energy Journal, with an episode called “Rising Seas”. This is the link to their facebook blog. http://burnanenergyjournal.com/rising-seas/ I found the show alarmist in the extreme. Nothing said was actually false, but it lacked perspective, it lacked numbers, an had an abundance of exageration and red-herrings. After all, why should New Orleans be a part of a show on sea level change driven by CO2 increases, when New Orleans problem is that the delta upon which it sits is sinking quickly. I caught about 30 minutes on KUHF Houston on 11/24/2013 at 6-7 pm CST. What I heard concerned Miami and New Orleans. Is it speeding up? Listening to your show, you cannot help conclude that Yes, it is speeding up. “Head for the Hills!”. That is quite a distortion of reality. If you look at the data, it is hard to see the rate of rise is changing. They give a sea level rise of 2.77 (+/- 0.09) mm/yr, or about 11 inches per century. This is measured from 1856 to 2011, quite a lenghty record. Al little different than the previous 5000 years. You spent quite a bit of time on Miami. At one point you said, that a rise of 1 foot was “very possible” within the length of a 30 year mortgage. No, it is not. Have a look at NOAA Tidal Gauges for  Key West, Florida. That record runs from 1910 to 2012 with a rise of 2.24 (+/- 0.16) mm/yr. In a century sea level rose 10 inches. Yet you tell people it is “very possible” it will suddenly accelerate from 2.24 mm/yr to 10.0 mm/yr to give a 1 foot rise in the length of a 30 year mortgage. There is no evidence for this acceleration. Even if you look at Vaca Key, that only records the past 40 years, it is only 2.78 mm/yr. I’d reference Miami Beach, but that record ends in 1980. See for your self. 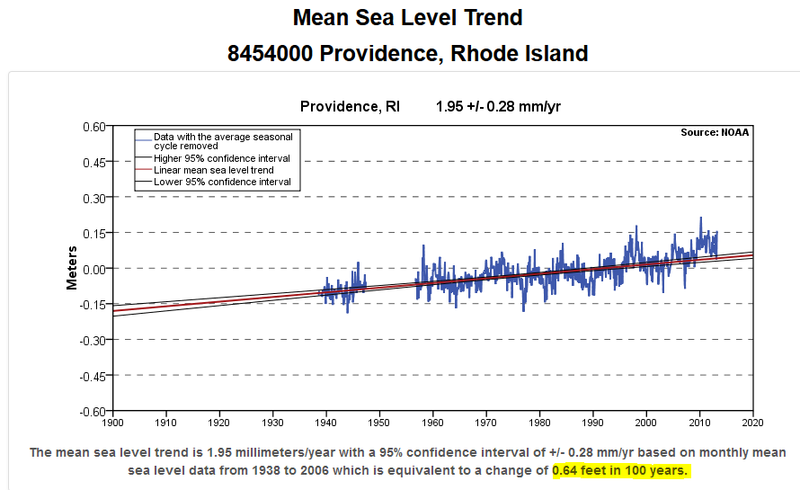 Sea level is rising, yes. Salt Water is encroaching, yes. Parts of urban miami flood more frequently when it rains, yes. But you oversold the rate of sea level rise by a factor of FIVE. No, it is not “very possible”. It is barely possible at all. On the bit about New Orleans, I’ll give you credit for mentioning that subsidence also plays apart on the *relative* sea level rise. I don’t think you were very specific, however, with the numbers. If the global sea level is rising 2.5 mm/yr, the ground of New Orleans is subsiding by 10.0 mm/yr, or 5 to 20 mm/yr depending upon which part of the city you refer to. 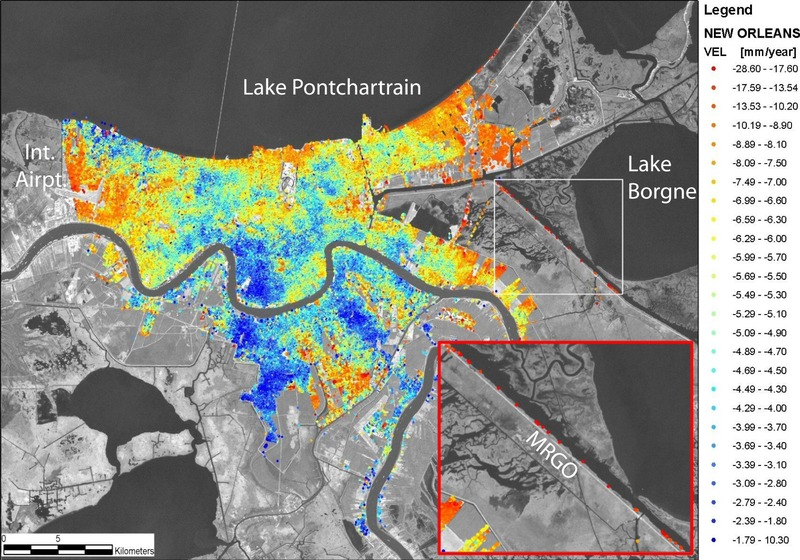 The issue here is, no matter what we do or not do to combat sea level change, New Orleans is sinking on account of entirely geologic sedimentary forces. So one wonders why it was included on your report of sea level rise at all, unless it was more for dramatic effect and less for imparting facts about the rate of sea level rise. Which only reinforces the theory that … you can’t fix stupid. Oh no! Beach Volley Ball is doomed! I guess then that freestyle water-skiing (y’know, the type where they do tricks in the air after launching themselves off ramps) will be just…water skiing. 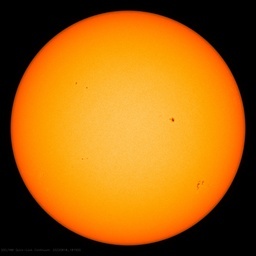 I could be wrong, but I think all that extra CO2 they gripe about is caused by the people jetting around to climate change conferences and talking about trying to change the climate – this goes back 121 years: http://www.lowerwolfjaw.com/agw/quotes.htm It fits, doesn’t it? Useful to whom? Just as useful as the buffoon Mann, to the Greedy Greens, who want a big slice of everyone’s pies. Well I guess that when sea-level rise has submerged the ski-runs, he’ll just have to go and find a lake with a slope on it. Pro Sports Execs “We should meet with the dumbest politicians in D.C. we can find and see if we cannot squeeze some ‘climate change’ money out of them to bolster our profits”. So whether you root for the Miami Heat, the Oklahoma Thunder, the Carolina Hurricanes, or any team in any sport, you should be concerned about global warming’s effect on sports…. Yeah, like last night’s football game between the Patriots and the Broncos. From my 11 years of weather data in New Hampshire, yesterday afternoon is the new coldest November day I’ve had. Combined with the wind, I bet we could convince the senator that negative global warming had a big impact on the game. I’m Canadian. Hockey is played indoors (called arenas!). Pond hockey doesn`t exists in urban areas, where most hockey is played. Even in rural areas, outdoor hockey has never been reliable (snow is the biggest problem, since you have to clear the ice right after a snowfall, which is not always possible). The NHL has ice rings all over North America, even in Florida. So I fail to see any link between warming and hockey being threatened. Dumbest? I think Guam tipping over still leads. The quid pro quo is continued taxpayer subsidies of stadiums for the leagues and related BS economic impact reports. Adding climate shamanism to this situation amounts to layered BS. I hope that his website is inundated (no pun intended) with links to this post as I’ve just done. 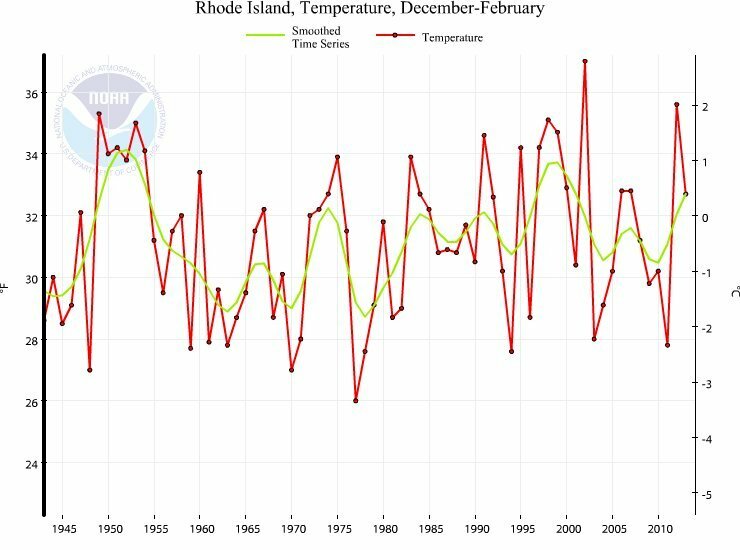 Rhode Island is politically New York/Boston/DC, so no surprise at such idiocy. One can’t help but feel that a Spoonerised version of the Senator’s name might be more apt. Maybe the NFL/NBA/others were considering building expansion facilities in Venice, Italy, and the good Senator saved them from their foolishness. And perhaps the sky is really pink. Where do you live — Vancouver? I grew up skating on a rural marsh in NB. If there’s snow, you clear it. But normally there isn’t, because the winds will clear the ice. When we were too lazy to go all the way to the marsh (a good 20-minute walk away) we’d skate in the back yard, where we made our own ice by dumping buckets of water on the ground. Currently I live in Montreal; the city’s outdoor skating rinks open December 15, or whenever things freeze up if it’s not frozen by then — which it hasn’t been, lately. It’s common in winter to see people going around town carrying hockey sticks and skates, headed to or from an outdoor rink. In the hills to the North of the city, small towns plough their lakes to make a city rink. University and professional sports leagues want more controlled circumstances, but kids definitely grow up skating outdoors in much of the country. Global warming is shrinking the length of the outdoor skating season. According to Wikipedia Senator Sheldon Whitehouse was investigated for Insider Trading. So Senator Sheldon Whitehouse what is his property investment portfolio. So with the great Global Warming Melting icecaps sealevel rises panic he could bag himself some nice desirable beach front real estate. It sounds like this guy is just dumb enough to be our next President. Some people (47%?) would probably support him just for the novelty of having a President Whitehouse…in the white house. Senator Sheldon is in on it. He knows CAGW is false. He’s playing it for control. The control that fear can bring. He is representative of the cabal. The AGW cabal that is now so apparent. They are called the “Progressive Left” now. They used to be the “Red Menace”. Times Change and Socialism changes its cloths. Sheldon and his ilk are dangerous opportunists . They spread the propaganda fervently. With Gusto. They’ll have good jobs in the new order. The reason for closed door meetings is to prevent the truth from seeping in. Alvin’s 4:01 comment is priceless! May not be original but at my age lots of jokes are new more than once. In time the dumbest thing ever will turn out to be climate change deniers. Sports stadiums or sports are the least of our problems. What amazes me is an intelligent man like Ed reposting this drivel and the a denier blogger using his energy to refute the obvious. I just with we could send them and the fossil fuel companies the bill for their mass propaganda denial campaign- it is public fraud and the you should be ashamed to aid an assist it. Gee! Can we get back the 100 billion damage done BY your climate change deniers – you know, the many government-paid so-called scientists who deny natural climate changed before man’s addition of a vital item to the ecosystem allowing all plant growth to expand 12 – 18% percent the past few decades? Can we get back those 25,000 “excess deaths” you murdered in the UK last year by deliberately increasing the price of energy, food, transportation clothes, fuel and housing? There are no problems, no hazards, no dangers from any increase in CO2 between 280 ppm and 1000 ppm; there are no problems, no hazards, no dangers from any increase in global temperature between 1/2 of one degree and 2-1/2 degrees. Further, you cannot even establish that any increase in CO2 will actually cause a rise in temperatures. You cannot establish the probability of any increase in global temperature past 3 degrees, and – given your government-paid lab’s results so far, you cannot even determine the sign of any CO2-temperature feedback over even a 20 year period. There are millions killed by YOU in your efforts to stop that rise. Can you tell me exactly how much you are paid for your religious belief in CAGW? Why should we trust any government-paid “scientist” for repeating government-paid research to generate government-needed tax revenues for government-paid bureaucrats? After all, have you not claimed (without any evidence at all) that skeptical critics create “science” based on their funding; so – when a skeptic DOES has evidence of massive government spending influencing massive government-sponsored grants to produce government-needed results from government-funded universities and from government-funded laboratories printing government-dominated publications? I don’t see you refuting any of the facts presented here … just name-calling, conspiracy theories about fossil fuel companies, and irrational ranting. ‘The dumbest thing ever’ is someone who can’t write a simple paragraph without multiple grammatical and logical errors expecting to be taken seriously while lecturing others on science. Not particularly self-aware, are you?